You don’t have to be a Catholic to appreciate the beautiful colonial churches of Buenos Aires. God generally inspires some of the best architecture around, and in Buenos Aires it’s no different. The San Pedro Gonzalez Telmo church is also known as the Nuestra Señora de Belén (Our Lady of Bethelehem) church. A good church can never have too many names. It’s very hard to get a decent picture of the church because the street is of the normal narrow, cobbled San Telmo ilk, and there are large trees getting in on the act – so bring your wide angle camera lens. 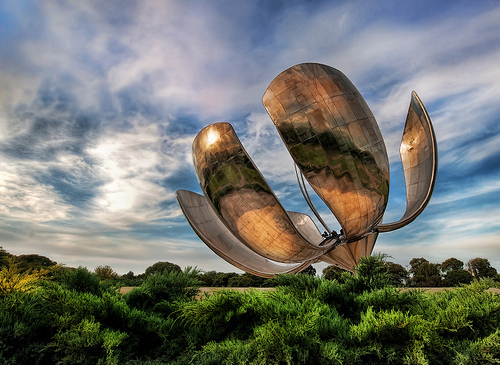 Of course, it is a National Historic Monument, which may sound impressive, but is a title that is awarded to almost anything of minor importance here in Buenos Aires. Up the top of the church, in the center, you can see San Pedro Gonzalez Telmo himself. He was a Spanish Roman Catholic priest, born in Astorga (Spain) in 1190, and devoted his life to enlightening the poor. Old Pedro Telmo may not condone all the saucy Tango dancing that goes on in his barrio nowadays… however, he is also the patron saint of Spanish sailors, so he may not be so easily shocked. The inside of the church isn’t all that extravagant compared the the beautifully decorative exterior. It does display some nice oil paintings, your usual pulpit… it is more the quiet and peace that draws passers-by within churches such as this. And that’s not something easily found in Buenos Aires city. It was that outbreak that also changed the face of Buenos Aires a little. Previously, San Telmo was home to the rich elite of the city. The yellow fever outbreak forced them out of the area, and they found a new home slightly further north, in Recoleta, which remains the home of the extravagantly wealthy to this day. San Telmo turned into an area of fading grandeur that now makes it so attractive to visitors, while in Recoleta the dazzling French architecture that delights tourists in equal measures was erected by the upper classes. In the end, it is the “bar” part of “resto-bar” which is worth visiting. Games. To spice up your weeknight, Acabar offers a selection of board games to help loosen the mood and keep the atmosphere relaxed. You and your friends can choose from old favorites like Jenga, Pictionary and Battleship – and don’t be shy to invite neighboring tables of people to play along with you (or against you). The games not only help to enjoyably pass the time, they can function simultaneously with your cocktail as a social lubricant. Great name, in fact. Multi-faceted. Firstly, it has all kinds of comedy potential. In English, acabar basically means “to finish”, and those who are clever enough in Spanish can manipulate the name of this place into all sorts of sexual innuendos. Secondly, if you break the name down, it separates into two Spanish words: “Aca Bar” translating into “here-bar,” letting you know that you have indeed arrived where you wanted. But the bar itself is great too. Besides the many wonderful board games, the wait staff are extremely nice and friendly, and there are usually enough of them around to be able to grab one quickly for drink orders even when it’s busy. And it does get busy, producing a happy, buzzing atmosphere full of mildly inebriated board-gamers. Acabar is also HUGE, which is helpful for seating large groups of gamers. You’ll have no problem getting a table as the place opens up round the corner to the left and backwards, and just keeps on going, and going. At one point it feels like you may even have to traipse through their neighbors’ back-patios to reach the end of the bar. But don’t let that put you off your drinks. And all of that space is filled with character… interesting old chandeliers, pop-art on the walls, lots of funny ornaments and bits & bobs, a hundred different types of wooden tables that have definitely seen better days but still add to the rag-tag look. All very pleasant in a hip kind of way, as you would expect from somewhere located in Palermo Hollywood. Stan Stalnaker’s website Hub Culture has come up with a ‘2007 Zeitgeist Ranking’ for world cities, and our own Buenos Aires put in a respectable performance, sliding in at number 6. The idea that a lot of rich North Americans and Europeans are buying property in BA because it is cheap to do so is not exactly something that makes for a cultural center, but the ranking speaks for itself. It is more likely that the slightly less well off natives and skint expats are using their creativity to make Buenos Aires a ‘hot cultural center’. Etiher way, getting this kind of ‘award’ has to be good PR for Buenos Aires, and is therefore not to be sniffed at. Center of the Cultural Universe? “The idea behind the hub ranking is that at certain times in certain places, there is a veritable ‘center of the universe’ – a place where innovation, change and vibe combine to create the place of the moment. “The rankings are not about overt power or coolness, but that certain something that makes a place hot, on the verge, and really the place to be right now. It’s the place that later, everyone wishes they were at“. That sounds a little better. For a more concrete idea of why Buenos Aires is seen as hot right now, this Newsweek article provides an interesting picture of BA: The Capital of Cool. The Best Pizza in Buenos Aires? Pizzeria Guerrin is regarded as one of the best traditional Pizzerias in Buenos Aires, and definitely lives up to its reputation. This is a major accolade in a city where Italian food is so popular and widespread, due to the history of Italian immigration that provides the back bone for much of porteño culture. To read a little more about the Italian effect on culture here, check out articles on Banchero Pizzeria and Caminito, both in the barrio of La Boca, which is traditionally the main Italian community of BA. But for now it’s all about Guerrin, and its fantastic Pizza, so read on to find out why this restaurant is a must visit if you are ever in Buenos Aires. You see, Pizza in Buenos Aires can be a lovely, sloppy, cheesy affair. Placing the slice of Faina on top, as seen above, helps to neutralize things by acting as a sponge for all of the gooey mess. And it just seems to taste right, somehow. Why didn’t they think of this in Italy? To make things even more traditional, the pizza and faina should be washed down by a glass of inexpensive moscato; a very sweet, white dessert wine. Porteños have indulged in this eating ritual for years, and again, it just feels like the right thing to do when sitting in a pizzeria on Avenida Corrientes. The pizza pictured above is a Pizza Especial Guerrin grande, the house pizza. This is pretty much standard argentine fare for a pizza, with slices of ham and long thin strips of red pepper, in addition to the usual sauce, cheese and olives. Highly recommended, especially when joined by a few slices of faina and washed down with moscato, to really get you into the traditional spirit of things here in Buenos Aires.